Astrology is based on the fact that cosmic force of planets governs human body and life. The cosmic structure (signature) imprinted on us, at the time we were born defines our physical, intellectual, emotional, spiritual, and even karmic self. Not every planet is all-powerful at our birth time, and each planet gives varied effects on each individual. One of the major concerns of an astrologer is to study the horoscope, analyse the effect of each planet (see which effect is lacking or required), and assign the gemstone to enhance the required celestial force in our body and life. The electromagnetic vibrations of the gems interact with the aura of our body while in touch with our skin. It then forms a sort of productive energy on `union`, which brings about the change in the following spheres of our life. A gemstone brings significant change only when in alliance with the aura of a person. Hence it is advised to wear the stone consistently and not take breaks for a long time. Gems are similar to a lightning rod. They create, what is in effect, a protective field around the body, which regulates celestial forces absorbed by the body. 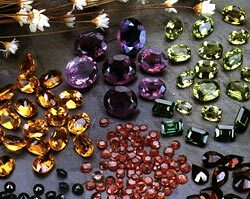 In time, the proper gemstones, if kept in contact with the skin, can bring about miraculous changes in mind and body. Gemstone astrology is the way to implement remedial measure to achieve overall success in life. Although due to lack of proper scientific research, application of this science is looked upon as superstition, the fact remains that when guided by a good astrologer, scores of people have had immense benefits by these brilliant sparkling stones influencing human destiny. According to Indian wisdom of astrology, the nine main gems acting as the cosmic boon to human life are classified under `Navratna`.